Several Brighton players down the years have been known as ‘The Tank’ for the power of their play, but I think Des Tennant was the original. He signed from Barry Town in the summer of 1948, as a 22 year old, and made a whopping 424 appearances for the club. In the ten years when he was a fixture in the side, Tennant was also captain for three seasons, including in 1953/54 when Brighton were runners-up in Division Three (South). Unfortunately, in those days, only the champions were promoted. He also scored 47 goals, 23 of which were penalties. One particular goal is remembered fondly on North Stand Chat by the user nobody’s dupe. He recalls the days when clubs would play home and away fixtures against the same opposition over Christmas. Brighton gave Newport an unhappy present on Christmas Day 1952, thrashing the Welsh side 3-0 on their own ground. Two days later, in the return fixture at the Goldstone, Albion were 1-0 up at half-time but then surprisingly found themselves trailing 2-1. It took a long-range effort from Des to save the day. Des enjoyed a benefit match against Brentford in May 1954. He retired in 1959 to join the coaching staff. 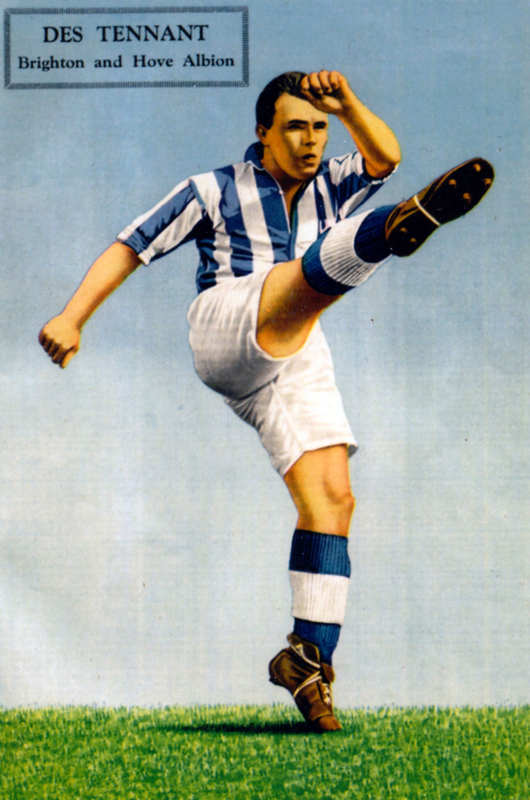 The image above, from a magazine, in a football shirt that buttons all the way down the front, is used to form the crest of the Brighton & Hove Albion Collectors and Historians Society.